November is Pancreatic Cancer Awareness Month 2015, something which is a very important subject to me. 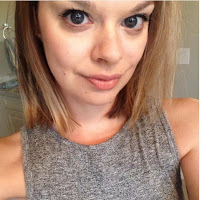 I reached out to Pancreatic Cancer UK telling them that I wanted to write a blog post about Pancreatic Cancer Awareness Month. They have provided me with statistics about pancreatic cancer and information about their work. In 2013, my grandad was diagnosed with pancreatic cancer. Pancreatic cancer is very difficult to diagnose and is often misdiagnosed. They originally thought it was my grandad's gallbladder causing him to be ill so he was booked in for surgery regarding gallstones. It very quickly became clear that something more serious was wrong. Unfortunately, the cancer wasn't diagnosed quick enough - a problem which is sadly very common with pancreatic cancer. His health deteriorated rapidly and he died around 6 weeks after being diagnosed. * The disease has the lowest survival rate of all 21 common cancers, with just four percent of people living for five years or more after diagnosis, and just one percent surviving ten years. * Five and ten-year survival for pancreatic cancer has improved very little since the 1970s. * Around 8,800 people are diagnosed with pancreatic cancer in the UK. That's 24 per day. * Pancreatic cancer is the fifth most common cancer death in the UK. * Pancreatic cancer is predicted to become the fourth largest cancer killer (overtaking breast cancer) by 2030. Pancreatic Cancer statistics quoted from Cancer Research UK. 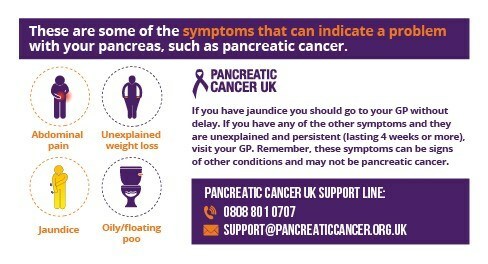 You can find out more about the types of Pancreatic Cancer and symptoms here. * Pancreatic Cancer UK is the only national charity fighting pancreatic cancer on all fronts: support, information, campaigning and research. They are striving for a long and good life for everyone diagnosed with pancreatic cancer. * They provide expert, personalised support and information services, with the ultimate aim of enabling patients to enjoy an extended, happy and fulfilled life, bringing hope to them and their families. * They fund innovative research that makes the most impact with limited resources and leverages additional investment - and development of new talent - through their own research expenditure. *Working closely with patients and their families and carers, clinicians and other healthcare professionals, researchers, politicians and policy makers they seek to increase awareness of the disease and bring about change.